Jarvis Jones has been an impact player at Georgia, but I don’t think he will be a dominant pass rusher in the NFL. Jones doesn’t have ideal measurables for a 4-3 defensive end and is a little light for the 3-4 OLB position. He is listed at 6’3”, 241 pounds but it wouldn’t surprise me if he measured in at 6’2” and 235 pounds or so. He’s not a huge player and he doesn’t look like he has a ton of room on his frame to “bulk up” and get up to 255-260 pounds or so. Jones isn’t elite in this area, but I think he is good enough to play 3-4 OLB or 4-3 OLB at the next level. He seems to diagnose plays pretty well, flows to the ball well and does a good job of setting the edge in the run game. He understands his responsibilities and doesn’t abandon his responsibilities in the run game to roll the dice on rushing the passer. He has been used to spy scrambling quarterbacks during his time at Georgia, and seems to have a good feel for when he needs to keep contain. There are times when he takes too wide of an arc when he attempts an edge rush and the QB escapes through the lane he created, but typically he adjusts and doesn’t make the same mistake over and over again. Jones excels in pursuit and has impressive range despite what I perceive as a lack of elite straight line speed for a 3-4 outside linebacker. He has a great motor and consistently gives good effort from the backside whether the play is near him or whether the ball is far away from him. He knows how to flow through trash and has a lot of experience taking on blocks because of playing at the line of scrimmage. Jones isn’t a great tackler but he is a pretty good tackler. He attempts too many arm tackles for my liking, but seemingly every player I scout these days does. He shows that he can wrap up and he can generate pop on contact. He also has a great knack for forcing fumbles as evidenced by his 9 forced fumbles the past two years (including an incredible seven just this year) and that speaks to the power he can generate when he tackles a ball carrier. This is one area that I’m not very comfortable with Jones on. He has been such a productive pass rusher the past two years that it’s almost criminal to drop him into coverage, but Georgia did mix that in at times and while I think he is raw in this department I think he can develop if asked to do more of it at the next level. I haven’t gotten to see him make straight drops in coverage, but I think he has the potential to fit at outside linebacker in a 4-3. Jones isn’t elite at the point of attack by any means, but he’s not as much of a liability as I expected him to be. He doesn’t have ideal arm length for a pass rusher and it will hinder him if he’s asked to play 4-3 DE or 3-4 OLB in my opinion. He is stronger than I expected him to be and he has shown that he can anchor against bigger, stronger players at the point of attack, but at the same time I’ve seen him blocked effectively by tight ends like Michael Williams and Justice Cunningham. He has shown that he can use the length he has to keep blockers from getting into his chest and he has a pretty good feel for controlling the blocker before he sheds the block to wrap up the ball carrier. He has shown that he can set the edge and consistently shows that he has the strength to walk a defender into the backfield and help disrupt outside running plays even when he doesn’t come free and necessarily make the play. He’s not a dominant run defender by any means, but I don’t think he’s nearly as much of a liability as he is portrayed to be sometimes. This is traditionally considered Jones’ greatest asset, but I’m not as convinced of his pass rushing prowess as some others seem to be. First, his get-off is not as explosive as you would think it was after hearing about how dominant he has been. He rarely fires off the ball using all of his athleticism, though I imagine some of that has to do with him being assignment steady. Still, it prevents him from gaining an instant advantage against blockers he theoretically should be able to beat off the edge if he is as explosive as we were led to believe. Second, I watched 14 games of him before writing this scouting report (it was a mix of games from his redshirt sophomore season and from his junior season this year) and I never once saw him explode off the ball, go with a straight speed rush, execute a shoulder dip and beat the tackle for a clean sack. That concerns me for a number of reasons: First, and most obviously, this signals to me that he can’t win with a simple speed rush in college which means there is no reason to believe he’s going to be able to win with a speed rush at the next level. Second, he seems to be a little stiff and it shows when he tries to bend the edge. Third, it means he has to use his quickness, power and non-stop motor to generate pressure (which he has obviously done quite successfully in college to the tune of 26 sacks the past two seasons). That isn’t necessarily a bad thing, especially since quickness, and that kind of effort level generally translate pretty well to the NFL. However, at 240 pounds or less, I have questions about how well his power moves will translate to the NFL even though I’ve seen him convert speed to power pretty nicely when bull rushing. He is obviously a good pass rusher, and he has shown that he can slap away the hands of a blocker to gain an advantage when rushing. He has also flashed a spin move (though I’ve never seen him use it en route to getting a sack), but he could still stand to improve his hand usage and develop his swim move. He could also really use a good rip move since he likes to go inside so much. That is where Jones creates almost all of his pressure- beating tackles inside, stunting, and by chasing quarterbacks down after the pocket collapses even when he hasn’t necessarily beaten his man 1 on 1. By adding a powerful rip move he could improve his ability to win by going inside even more. The problem with that is at the next level he’s not going to be able to beat tackles inside nearly as easily if he can’t threaten their outside shoulder with a dynamic speed rush, and that is extremely concerning. Without at least the threat of beating them off the edge any smart tackle will avoid opening their hips up too early and be looking for him to attempt to dart inside or attempt a rip move on their inside shoulder. With those pass rush options taken away (remember, that’s how he generates a lot of his pressure) he won’t be nearly as effective and a lot of people that didn’t study him and realize that he just isn’t an explosive edge rusher will be completely dumbfounded. That’s why I don’t think he’s going to be a stud pass rusher in the NFL, and it’s why I’m not convinced his best position at the next level is outside linebacker in a 3-4 defense. I have never spoken to Jones so it’s hard to evaluate his character, but from everything I have read he seems like a great kid. First, there is this CBS special focusing on how he overcame his 19 year old brother being murdered outside of a bar on his birthday. Second, there was this article in Sports Illustrated discussing his brother’s tragic death and being diagnosed with spinal stenosis, a narrowing of the spinal column that causes pressure on the spinal cord. USC was concerned that this could lead to a serious neck injury and wouldn’t clear him to play. He requested and was granted a release from his scholarship and that led him back home to Georgia in Todd Grantham’s 3-4 defense. It’s hard not to root for a kid like Jones who has been through so much on and off the field and come out a better person for it. I was particularly moved by the last part of the Sports Illustrated article where he discussed opening a rec center in Stewart County in honor of his older brother. He really seems to have his head on straight and that combined with his great motor and effort level on the field makes me think that he won’t be any kind of character risk even after he signs a multi-million dollar contract. The spinal stenosis is going to be heavily scrutinized though. I imagine a number of teams will take him off their board completely because of that medical red flag despite the impressive production he has had in college. That will hurt his draft stock, but it only takes one team and even if that red flag pushes him down draft boards I think that will just be another hurdle that Jones finds a way to overcome on the way to a successful NFL career. I’m no doctor so I can’t make any educated guess about how long of a career he will be able to have, but that will be something that every NFL team inquires about at the combine. I think Jones is a quality NFL prospect, but I don’t think he is going to be a dominant pass rusher at the next level and I have questions about how well he projects to the 3-4 OLB position in the NFL despite his obvious success in that role at Georgia the past two years. This probably won’t be typical of many evaluators, but I think he would be a great 4-3 OLB candidate at the next level, particularly at strong side linebacker (which is ironically where USC was playing him). He has a lot of experience blitzing off the edge, stunting inside and has even been used to spy scrambling quarterbacks so he won’t have issues rushing the passer or spying the passer at the next level. He may not be a dominant run defender for a defensive end or a 3-4 outside linebacker, but for a 4-3 outside linebacker he has more than enough size, strength and block shedding experience to fill versus the run, set the edge on the outside and make impact plays in the backfield. I am not that comfortable with him in coverage yet, but he has shown flashes of being able to turn and run with receivers and has some experience dropping into short zones. There’s just not a ton of tape available showcasing his ability to drop into coverage, but I believe that he has the athletic ability and the intelligence to do it well if he is coached up. I think the 4-3 OLB position plays to his strengths best- he won’t be hindered by his struggles to win off the edge with a pure speed rush because he will be blitzing instead of being relied upon to generate pressure as a defensive end or 3-4 outside linebacker every snap, his perceived struggles versus the run as a DE/OLB may even be turned into a strength since he has so much experience attacking blocks and shedding them at the line of scrimmage, and he has enough athletic ability to at least give dropping into coverage more a try. Even if he doesn’t excel in coverage the strongside linebacker is often taken off the field in nickel and dime packages where he could put his hand in the dirt and rush the passer if the defensive coordinator wanted to keep him on the field. He’s a good linebacker and a quality kid, so even though I don’t think he’s going to be a dynamic pass rusher I still like him as a prospect. He just has such a knack for making plays through his effort (look at all those forced fumbles, plenty of them are because his motor never stopped running and he caught a player from behind and punched the ball out) and I think NFL teams are going to be impressed with him when they interview him if they can look past his potential medical concerns. This might seem outlandish, but I don’t think he’s even close to a lock for the top 15 right now and after people start overreacting to his medical condition there will be plenty of people exclaiming that he will fall to the 3rd round or maybe even further if enough NFL teams take him off their draft board. I won’t try to downplay how serious his condition can be because based on what I understand he could be at risk for a serious injury, but I think that a team in the late 1st round will see a kid with a great motor, work ethic and a history of impressive production and either slide down to select him or move up and get him in the 2nd round. I personally think he could be a very good 4-3 strong side linebacker, but I’m sure plenty of NFL teams will assume he will be a quality 3-4 OLB as well. I’m not quite so sure, but it’s hard to ignore all he has produced at the college level. Matt Barkley has decided to return for his senior season at USC. I like this decision and I am excited to see him play for one more year, but there will be a lot of pressure on him to be great. I may have told some of you that I had a hunch that Barkley would come back for his senior season. It didn’t always seem particularly likely, but I had a feeling he might. He seems like the kind of guy who wants to win and wasn’t just in college to help him make it to the NFL. It seems that is the case after all as Barkley announced at 4 pm ET live on ESPN that he would be returning to USC for his senior season. He stated that he felt the 2012 Trojan squad had “serious unfinished business” and made it clear that his goal was to return to USC to try to lead them to a Rose Bowl or perhaps even a BCS National Championship. That will be a tall order, but Barkley returns to a team loaded with talent especially on the offensive side of the ball. The offensive line is the only potential question mark, but he has two future first round picks at wide receiver in Robert Woods and Marqise Lee plus an emerging star at running back in Curtis McNeal. I am very much looking forward to watching him for his senior season, and I’m kind of glad he decided to come back. It is worth noting that he is losing star left tackle Matt Kalil, so the offensive line will need some tweaking. I think he had more to gain from coming back for his senior year than Andrew Luck, Robert Griffin III and Landry Jones do. Luck has made it clear he is leaving, but Griffin and Jones have not made their decisions public yet. Personally, I would be surprised if both didn’t declare considering Griffin has become the clear #2 quarterback due to Barkley’s absence and Landry Jones’ stock has moved up as well due to the lack of 1st round talent at QB this year outside of Luck, Barkley and Griffin. Now, I like the decision Barkley has made, but it’s not a perfect one. He is opening himself up to a lot of risk. He could get injured, he could have a down season, and even if neither one happens he is opening himself up to a boatload of nit-picking criticism because media pundits and draft evaluators have an extra year to evaluate him to try to figure out every aspect of his game. I think the decision makes a lot of sense, but the attention he will have on him may end up being comparable to what Luck endured this season. He isn’t quite the prospect that Luck is, but he is going to be the consensus #1 pick for the 2013 NFL Draft now. That means a lot of attention for everything he does. I think he is probably ready for that, but it’s still a lot of pressure on a pretty young kid. I think it will work out for the best though and I think Barkley will help lead USC to the Pac-12 Title Game and a possible Rose Bowl berth. I’m not sure I’d bet on them for the National Championship game, but anything is possible. Regardless of how USC finishes the season it would be foolish to bet against them going to a bowl game for the first time since Barkley’s freshman year considering all the talent they are returning. I for one can’t wait to see them play next year. Positives: First and foremost you notice his frame which is great. He’s tall and has a lot of room to add additional weight. The second thing you notice is how well he moves for someone that is listed at 280 pounds. He has a good first step, he can mirror just about anyone’s speed rush due to his athleticism and he gets to the second level effortlessly. He should have no problem mirroring even elite speed rushers in the NFL because of his effective kick slide and impressive lateral agility. His value will be highest as a pass blocker though he shows the ability to seal in the run game and also drive block smaller defenders. One thing to love about Smith is his upside, because with his athleticism he could be an elite LT in the NFL if he gets coached up and polished. Negatives: Smith is a pretty raw prospect. He probably hasn’t been playing at his listed weight of 280 and he really needs to get stronger, especially in the lower body. He will struggle to anchor against bull rushes at times even against smaller defensive ends. Getting stronger in the lower body will help him in the running game as well. His technique needs development also. His footwork seems to be fine in his kick slide, etc. though he doesn’t always keep his feet driving as a run blocker. His initial punch in the run game and as a pass blocker is relatively ineffective and rarely, if ever, shocks the defender he is blocking. He will also struggle to sustain blocks because his technique is pretty raw and at times will just be getting in the way as a run blocker rather than blocking his defender and driving them out of the play. Overall: Smith is a really intriguing prospect, but I can’t say I am super high on him. He has tons of ability, but you have to wonder why he didn’t end up the starter at LT given his incredible athletic ability that is perfectly suited for the LT position. He was suspended for the bowl game last season because of academic issues and my gut is telling me that he is a guy who has been coasting on his insane athleticism for a long time, so I wonder how good his work ethic is. If his work ethic is good and he goes to a team with a quality offensive line coach he could get a lot better during his first couple of seasons in the league and potentially develop into an elite left tackle in the NFL. But if his work ethic isn’t what it should be then he probably won’t put on as much weight as he should, he probably won’t work to polish his footwork, improve his initial punch and develop his technique and hand placement. If that is the case then he will never live up to his insane potential given his amazing athleticism. And when I say amazing I mean amazing. I have watched him mirror a blitzing corner coming off the edge more than once, which is really a sight to behold. 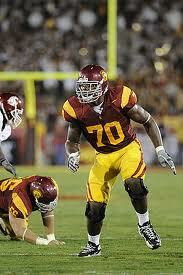 Especially from a right tackle which is what he played at USC. Projection: Top 15- Smith is all-potential and he won’t contribute much, if anything, as a rookie, so his value will be limited from that standpoint but he has such a great frame, long arms and amazing athleticism for the position. He should be the first LT off the board for this reason, potentially even in the top ten. The best way to describe Smith in my opinion is a guy with top 10 athleticism and 3rd/4th round technique. If his technique ever catches up with athleticism you will have an elite player on your hands, but you never know if that will happen. Here are my current QB rankings as of early November. This list does not indicate the order that I think they will come off the board in April, but rather which I like the most at this juncture. Enjoy! 1- Andrew Luck, QB, Stanford- Luck has a great combination of size, good arm strength, accuracy and he is a very intelligent QB. I don’t think he will come out this year but if he did I think he has the football IQ to transition effectively to the NFL, much like Mark Sanchez. 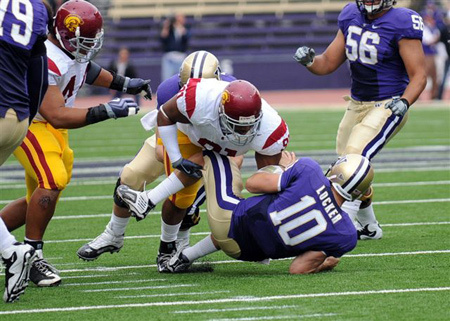 2- Jake Locker, QB, Washington- Yes, I have Jake Locker #2 even though I have Mallett going #1 overall in my mock draft. I personally think Locker will be the better NFL player, though he will need more coaching than most probably thought after his incredible progression from his sophomore to junior year. His intangibles are just so special that a good QB coach could really make him a quality NFL starter. 3- Ryan Mallett, QB, Arkansas- Mallett has as much potential as any QB I have ever scouted because of his amazing arm strength and great size, but how good of a leader is he? How dependable is he late in games to make the right decisions and not turn the ball over? I don’t like his intangibles and his leadership ability and that combined with the offense he plays in, which is not preparing him for the NFL, make me doubt him as a prospect. However, that is just my opinion, and I still believe he is the odds on favorite to go #1 if Luck stays in school. 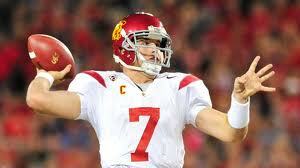 4- Kirk Cousins, QB, Michigan State- I really like Cousins’ game so he stays high on my rankings. He has been effective this year, but I am a little concerned about how he played against Iowa. That was a huge game for Michigan State and he made some mistakes that led to three interceptions. However, I think he has the tools to be a good starting QB in the NFL. 5- Christian Ponder, QB, Florida State- Ponder has disappointed me in the little that I have seen him this year, but it’s not enough to drop him out of the top 5 of my rankings. I still think he will be a solid starter in the NFL, but he doesn’t look like a franchise QB to me. He is a fringe first rounder in my opinion at this point, so we will see how he does the rest of the year. 6- Greg McElroy, QB, Alabama- McElroy has been very efficient this year but I am not sure he is much more than a solid NFL starter. I think he will be a solid mid-round pick and he seems to be very intelligent and if he had a good running game and some quality targets to throw to I think he could be an effective QB. Like Ponder I think he may be a product of the players around him rather than a Franchise QB/leader that makes the rest of his teammates better. 7- Nathan Enderle, QB, Idaho- Enderle was one of my favorite QB’s coming into the season but he has had a very down year so far involving a lot of turnovers. I’m not willing to drop him down in my rankings yet since I haven’t scouted him in any of them specifically yet. However, I have definitely been disappointed with how he has played statistically thus far this year. 8- Cam Newton, QB, Auburn- It is hard not to rank Newton in the top 10 even though he hasn’t shown me as much as I would like to see as a passer. In my opinion Newton is performing at a level that everyone expected Terrelle Pryor to perform at. He has shown the ability to throw the ball well, but his athletic ability and smoothness as a runner is what sets him apart from other QB’s. He has a lot of improvement to make as a passer, but to produce like he has as a first year starter in the SEC is absolutely amazing to me. I really hope there isn’t anything to these allegations of taking money for signing a LOI (Letter of Intent) because he is a fun player to watch. 9- Pat Devlin, QB, Delaware- I haven’t ever seen much of Devlin, but from what I have seen he doesn’t seem to have a very strong arm but he does have pretty good accuracy. I don’t think he would be getting the same attention he has gotten from draftniks if it wasn’t for Flacco’s early success in the NFL out of Delaware, but he looks like a solid draft prospect to me. 10- Ricky Stanzi, QB, Iowa- Stanzi has been statistically impressive this year and currently has the second best QB rating in the entire nation. I have not scouted him much this year, but he has had a strong statistical showing this year to be sure. In his last three important conference games against Michigan, Wisconsin and Michigan State he has thrown a combined nine touchdowns with no interceptions which is incredibly impressive. 11- Stephen Garcia, QB, South Carolina- Garcia has shown some really incredible flashes, such as his 17/20 performance when the Gamecocks upset Alabama, but he has not been as consistent as I would like. In his three games since the Alabama upset he has thrown a combined five touchdowns with four interceptions and for the first time all season he completed less than 65% of his passes in a game in two of those contests. It will be interesting to see if he bounces back to finish the season strong, because right now he is a mid-round pick in my opinion. 12- Blaine Gabbert, QB, Missouri- Gabbert is definitely on my radar but I would be surprised if he declared this year. He has impressive arm strength and accuracy along with good size, but he doesn’t have much in the way of mobility and I don’t like how often he is in shotgun and how much Missouri runs sets with four or five wide receivers. He definitely has NFL potential, but I think he needs to stay for his senior year to have a shot at the first round. 13- Landry Jones, QB, Oklahoma- Jones has had an incredibly productive season in his first full season as a starter and he is only a sophomore. He is playing much more efficiently, but he hasn’t been tested by many great defenses. I really wish I could see him play against Nebraska’s defense this year because they have made some really good QB prospects look like mid-round draft picks this season. He definitely has a lot of potential, but I have the same concerns about the offense he is playing in that I had with Sam Bradford. 14- Andy Dalton, QB, TCU- Dalton has had a good statistical season but he really hasn’t played anyone outside of Oregon State in the first week, and he struggled in that game statistically. I was not impressed with Dalton at all after seeing him play against Boise State last year, so in my opinion he is a mid-late round pick in the NFL Draft. He has some redeemable talent and ability, but his ceiling is an average NFL starter. I think he may be better suited for a back-up role in the NFL, but I still need to scout him based off of his senior year tape. 15- Jerrod Johnson, QB, Texas A&M- I have a really good feel for Johnson’s game and I think he is a 4th round pick at this point, perhaps a 5th rounder, but he has good size, athletic ability and a strong enough arm to warrant development. He just puts too much touch and air under his passes, he has a hitch in his throwing motion where he dips the ball below his chest near his hip, and he has poor footwork and pocket poise. With a couple or three years of development he could potentially be a solid starter, but I think he will have a longer road to starting in the NFL than a number of QB’s that I have ranked ahead of him. 16- Tyrod Taylor, QB, Virginia Tech- Taylor has had an impressive statistical season but he has not been tested much other than the first week against Boise State and potentially against NC State. It will be interesting to see how he performs against potentially tougher ACC teams like Georgia Tech, North Carolina and Miami, but if he continues to play well he will have a chance at the middle rounds, especially if he demonstrates some patience and pocket poise. 17- Mike Hartline, QB, Kentucky- Hartline has been making me regret not naming him my pre-season sleeper at QB for the majority of the season. He played very well against Auburn, South Carolina and Georgia combining for over 900 passing yards and nine touchdowns with only one interception. He is having an impressive season overall, and I look forward to watching tape of him to see if he has improved on some of the things I saw him struggle with when I watched him against Alabama last year. Hopefully he keeps this up. 18- Ben Chappell, QB, Indiana- Chappell has had a pretty solid statistical season, however those numbers are padded by games against teams like Arkansas State, Towson, Western Kentucky and Akron. He produced about 1,250 passing yards, a completion percentage of around 68% and 13 touchdowns with no interceptions in those four games. He torched Michigan for an astounding 480 yards passing with three touchdowns and one interception, but he had disappointing games against Ohio State, Illinois and Northwestern where he threw only two touchdowns with a combined six interceptions. He is a late round pick right now, and from what I noticed in the little I have seen him he seems to have a bit of a hitch in his throwing motion. 19- Colin Kaepernick, QB, Nevada- Kaepernick is a true dual-threat QB. He is just as likely to beat you with his legs as he is with his arm. He has a strong arm, but I have never been very impressed with him as a passer. I haven’t scouted him yet this year, but I imagine his athletic ability and arm strength will warrant at least late round consideration when the Draft finally rolls around. However, I am not sold on him ever amounting into a solid starter in the NFL, therefore he will be down towards the bottom of all of my rankings. 20- Nick Foles, QB, Arizona- Foles should be back from his injury this weekend, so it will be interesting to see how he finishes his junior season out. When I have seen him play I have noticed him staring down his receivers quite frequently which worries me as far as his transition to the NFL is concerned. He has good size and a nice arm, but I worry about the offense he plays in and how often he stares down his primary receiver. 21- Terrelle Pryor, QB, Ohio State- Pryor is an incredibly gifted player, but he still seems like an athlete playing quarterback to me. He has definitely shown signs of improvement this year, but at the end of the day they are just signs. I think if he comes out after his junior season he will get drafted higher than he deserves, but that doesn’t mean he will pan out obviously. He might have a higher ceiling at wide receiver in the NFL than he does at QB, but that is an entirely different can of worms. 22- Mitch Mustain, QB, Southern Cal- Mustain has been residing low on my rankings all year, and it’s hard to say that he should be much higher considering how limited his playing time has been at Southern Cal, but I think he has the tools to be a successful back-up QB and if he is developed for three or four years I think he would have a shot at being a solid starter in the NFL. He has a lot of experience in a pro-style offense and that will help his transition to the next level. 23- Scott Tolzien, QB, Wisconsin- Tolzien is nothing more than a game manager at Wisconsin, but he does a good job of avoiding mistakes and he has shown some added ability to make throws on 3rd down this year when they need a conversion. He isn’t going to be much more than a back-up on the next level in my opinion, but I think he could be a solid back-up who could step in and manage the game should the starter go down. 24- T.J. Yates, QB, North Carolina- Yates is barely on this list and it is only because he has shown flashes of ability this year. I don’t think he deserves to be drafted at this point, and his ceiling is probably a #3 or at best a #2 in the NFL. 25- Justin Roper, QB, Montana- Roper is a guy who has impressive size but I have not been able to see him play. He has pretty impressive stats even though he is playing at the Division II level, but I look forward to being able to see his arm strength, throwing motion and overall mechanics if Montana is ever televised nationally. A guy with his size and production warrants some consideration. I thought I would put together a list of overrated and underrated players and give my thoughts on them. Hopefully you enjoy the list and feel free to comment if you agree or disagree! Enjoy! Locker has had a slow start to the season, and I don't think he is going to be able to live up to the pre-season hype and the comparisons to John Elway and Steve Young. -Jake Locker, QB, Washington- Like I said at the beginning of the season, I don’t think Locker will be able to live up to the crazy hype that has involved him being compared to John Elway and Steve Young. He has had a relatively slow start to the year and he had an absolutely horrible game against a very good Nebraska defense. Needless to say, if Mallett has a good game against Alabama he will probably move up ahead of Locker on most QB rankings. I like Locker, but he has things to improve on like every other QB and it will be hard for him to take the same leaps and bounds that he did during the season last year. I think he will be the second or third QB drafted depending on whether Luck comes out or not and on how Ponder does this season. -Dion Lewis, RB, Pittsburgh- He has had a very slow start to the season, and though he has been running against teams playing 8 and 9 men at the box at times he still hasn’t looked like the same runner as last year to me. He hasn’t shown me much patience as a runner, and doesn’t seem to have much of a burst to hit the hole right now. His back-up, Graham, looked much more effective against Miami and really showed the burst to hit the hole and gain good yardage. I’m not saying Lewis isn’t a good running back, far from it, but he had one of the great seasons ever as a freshman last year and expectations were unbelievably high this year, and I think he has really underwhelmed so far. Julio Jones has a lot of potential, but he hasn't shown the consistency that is more characteristic of high first round picks, especially those with his skill set. -Julio Jones, WR, Alabama- Julio Jones is an incredible athlete and has a ton of potential, but I think he is only scratching the surface of his potential at this point. I think he is one of those players who could be much better in the NFL than he was in college, but that is just my opinion. He hasn’t shown a lot of consistency in his time at Alabama, and though he can make some great catches and plays I would like to see him make plays more regularly. Part of this has to do with Alabama’s rather average QB play during his time here, but he should still be making plays despite that. Calvin Johnson always managed to. It will be interesting to see if he makes me a believer this year and shows a lot more consistency, but as of right now I think he is overrated by a lot of people because he was so highly recruited out of high school. He absolutely has NFL potential though. I just worry that he may be one of those boom/bust types because he will either get it in the NFL and be a very good receiver or he will remain a great physical specimen that doesn’t play up to his potential. -Greg Romeus, DE, Pittsburgh- I know Romeus is hurt right now, so his stock will probably come down a bit, but I don’t get all the love for this guy. Yes he puts up some nice sack numbers and he has good potential as a pass rusher, but I literally watched him get effectively blocked in 1 on 1 match-ups with TE’s against BUFFALO last year. I’m sure he has developed since then, but I haven’t had a chance to see him play this year so I have to assume that he hasn’t developed considerably better hand usage and block shedding ability. So under that assumption I have to say he is very overrated. If he can’t play the run and get off blocks from college TE’s then how is he going to be a NFL starter at RE and stand up to starting caliber LT’s in the NFL that are at least solid at run blocking? There isn’t any way. Until I see him play the run better, shed blocks better and also flash some serious pass rush ability (essentially more than just a good speed rush/edge rush) then he will be very overrated in my opinion. Allen Bailey has a lot of potential, but I don't think he is an impact player and I personally think he is one of the more overrated prospects in the country. 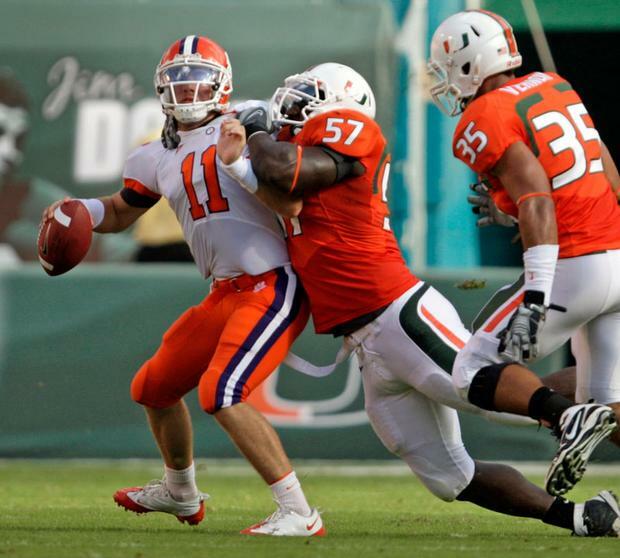 -Allen Bailey, DE/DT, Miami- I’m not sure there is a player in the country more overrated than Allen Bailey in my opinion. He looks awful every time I watch him play. He is a physical freak, he has great weight room numbers, and he looks like a good football player when you see him standing somewhere, but he doesn’t play well. Yes, he can get the occasional sack on a pass rush and yes he will make the occasional tackle versus the run, but I have watched him get blocked 1 on 1 by Lance Kendricks, Garrett Graham and other offensive lineman (Kendricks and Graham are both TE’s by the way) and I have seen them take him out of the play completely versus the run. Now, Bailey’s body type and skill set makes me think his best fit will be at 3-4 DE on the next level. I don’t think he has the edge speed or the quick-twitch pass rush ability to play DE in a 4-3, and I think that 4-3 DT would be his second best position behind 3-4 DE. However, he can’t shed a block to save his life. He has very bad hand usage, he is routinely the last player off the line and doesn’t have good burst off of the line of scrimmage, he doesn’t have a very good motor from what I have seen, and he doesn’t make impact plays versus the run. Not to mention every time he gets double-teamed he gets completely washed out of the play despite his great strength (which is a serious issue for a 3-4 DE prospect and a 4-3 DT prospect even if the guy is going to play under tackle in that scheme). I watched Pittsburgh’s offensive line double him and by the end of the play he was so far downfield that he when the offensive lineman still blocking him shoved him as he was giving up on the play he was no longer in the camera shot when the tackle was made. Bailey is so overrated it is ridiculous, and I wouldn’t pick him before the 4th or 5th round if I was a GM. -Marvin Austin, DT, UNC- He might not be overrated for long, but when people talk about him as a 1st round pick I think they are talking about his potential more than his actual performance. He has the potential to be an absolute dominant DT, but I have been waiting for well over three years to see that player and I haven’t seen it yet, and I may never see it at North Carolina because he might not even play this year. He has so much ability and so much potential, but he just hasn’t lived up to it as a Tar Heel. To me he is a boom/bust guy, and I would definitely think he is more likely to be a bust than a boom player if he doesn’t get to play all year. But that is just me. Guys like Austin really scare me as NFL prospects because they have a lot of ability, so you pick them earlier than you probably should, and more times than not (in my opinion) they end up being a waste of a high NFL Draft selection. Harris has potential, but I'm not sure he will ever live up to it, especially not in the NFL. 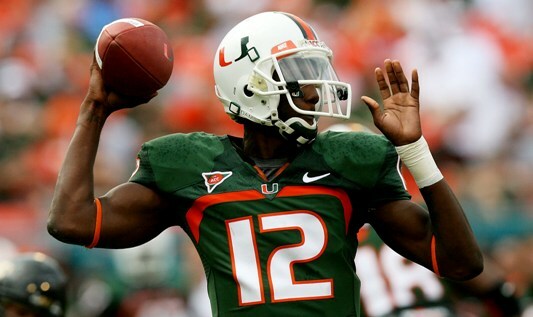 -Jacory Harris, QB, Miami- Harris is a guy that I have higher expectations for, but I don’t think he will ever live up to them. To do that he would have to put more zip on his passes and cut out his bad habit of putting so much touch on his throws, but he has continued to do it this year and I think the glitz surrounding his game and being the Miami QB has started to fade, and people are seeing him for who he really is. He’s a good college QB, but he’s not going to be a good NFL QB in my opinion. He is rail thin, he doesn’t seem very tough to me, he doesn’t look like a good leader, he doesn’t make good decisions under pressure, he forces throws into coverage and continues to make bad decisions, plus his passes have too much touch on them regardless of where he is throwing them on the field. So to me, Harris is overrated and has been for a while, but maybe he won’t be for long if he keeps throwing interceptions. Greg Jones is one of my favorite linebacker prospects in the country, if not my favorite. 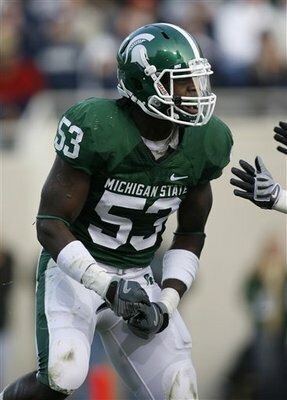 -Greg Jones, ILB, Michigan State- Jones is a fantastic linebacker and whether he plays inside or outside on the next level I would be absolutely shocked if he doesn’t become a very good player. He is a great tackler, he has great instincts and even though he isn’t the biggest guy he supports the run well and is good in coverage. He is as good a linebacker as there is in the entire country in my opinion, yet he gets almost no press. He should get a lot more of the spotlight as the season comes to a close and the post-season activities start. I have a feeling he will show up big in the senior bowl barring an unfortunate injury. -Brandon Saine, RB, Ohio State- I have really liked Saine since last year when he was competing for PT with Herron in Ohio State’s backfield, but I think he has an opportunity to break out this year. He had a very pedestrian stat-line against Miami, but I haven’t watched that game yet to see how he managed only 7 yards on 12 carries. Regardless, I like him as a running back and I am excited to see how he does the rest of the season. Hopefully he shows up big for the Buckeyes since he is one of my sleepers for this senior class. -Ronald Johnson, WR, Southern Cal- Johnson isn’t the biggest receiver, but I like him as a potential sleeper this year. He might be too well known for that, but considering his past production I don’t think it is too far out of the question. Regardless, he has already surpassed his total for touchdowns from last season (he had 3 last year and already has 4 this year) and he has looked good in the time that I have seen him this year. He is definitely underrated in my opinion, and I am really excited to see how he does against better Pac-10 competition. Derrick Locke is a great sleeper prospect, and I am really excited to see how he fares in the SEC this year. -Derrick Locke, RB, Kentucky- Locke is one of my favorite sleepers and he seems to be having a good season this year. He already has 372 yards (including a 6.1 ypc average) and 5 td’s, plus 8 catches for 60 yards. He already has 69 touches on offense in three games for over 430 yards and 5 scores, so he is definitely a key cog in Kentucky’s offense. He is similar to Dexter McCluster in that way to me, because McCluster was the engine that made Mississippi’s offense go last year, and Locke is that same guy for Kentucky. I really like Locke, and I think he has the ability to be drafted in the 3rd or 4th round in the draft this year. -Randall Cobb, WR, Kentucky- Cobb has superstar written all over him in my opinion. He might not be the biggest, the fastest or the strongest, but the guy is a straight-up playmaker. He has 160 yards receiving (2 TD’s), 108 yards rushing (1 TD), 65 yards on punt returns (on 10 returns, 50 of which came on one touchdown return), plus 5 KR’s for 103 yards… he even has 2 completions as a passer (2/2 actually) for 34 yards and a score. He has a touchdown as a receiver, a passer, a rusher and as a return man… He is so versatile. I can’t wait to see him play against some SEC competition, because if he can make a couple big plays against those defenses then he can make a play against anybody. I think that about does it for my list of overrated/underrated players. I think this is definitely a solid list, let me know if what you would have done differently or what you agree or disagree with! Hey everybody, sorry I haven’t put up a new post in so long. I have been busy at my internship lately and I haven’t had time to break down any new games or do much work on my watch list. I am very nearly done with the offense though, so more rankings are sure to come. Today though, I decided to break down the Senior class of QB’s. I got a number of comments about my QB rankings, and I decided that I may have involved too many underclassmen in my rankings. I only did so because I think that those QB’s will very likely be better than most of the QB’s that are currently Seniors, but since a number of those QB’s won’t be in this draft class I thought I would start out with a more basic ranking system- Just Seniors. So here it is! 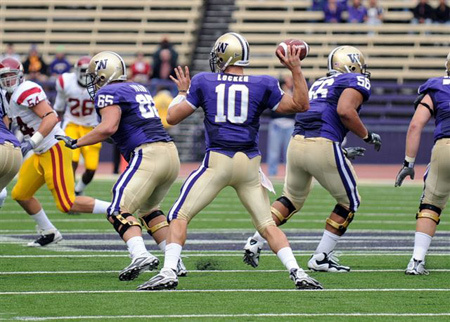 1- Jake Locker, QB, Washington- This is closer than you might think, but I think that if Locker can take more significant strides forward this year, similar to what he did last year, then he will end up being a very high first round pick. He probably has the best odds, at least right now, of going #1 overall. He has an extremely high ceiling and I have no reason to think he won’t continue to improve, so he gets the nod over Ponder here. 2- Christian Ponder, QB, Florida State- There isn’t much doubt in my mind about this one. I was very impressed by what I saw from Ponder last year, and I think he will continue to improve this season as well. I personally think FSU’s offense could be extremely explosive, and that certainly has a lot to do with Ponder’s development. If he continues to play very well and very efficiently at QB then I think his stock will shoot up, and he could very well be a top 15 or maybe even top 10 pick. 3-Pat Devlin, QB, Delaware- I have only seen some clips of Devlin on youtube, but they are pretty impressive. From what I have seen, he seems to have very impressive touch on his passes, he does a good job of moving in the pocket to find throwing lanes and does a good job of checking down and not forcing passes downfield. What he needs to show me is how well he can go through his progressions (because he was mostly going to his first read or checking down to his back) and how much zip he can put on more difficult, NFL throws. He shows impressive accuracy and touch, but you can’t get by on that alone in the NFL. He threw a couple passes that were good, NFL throws, but it was a little hard to tell how much zip he had on each pass. If he can show me that good, NFL zip on his throws then he could very well be an early 2nd round pick. Without it, he will probably be a 4th round selection. 4- Nathan Enderle, QB, Idaho- I have yet to see him play for a full game, but I saw him play a bit when I was looking at Mike Iupati last year (Iupati played OG on Idaho). He has good size, seems to have good arm strength but I was most impressed with what I saw of him against Bowling Green, where he led a very late comeback and ultimately won the game 43-42 after Idaho converted a two point conversion with four seconds left. He threw the touchdown pass to set up the tie and showed good poise and patience in the pocket on the two point conversion as he found his WR in the back of the end zone for the win. I am excited to watch him play and take more copious notes, and I want to see what he does this year. But I really think he has NFL potential based off of the little I have seen. 5- Jerrod Johnson, QB, Texas A&M- I have seen Johnson at his best when he was going blow for blow with Texas and Colt McCoy in a 49-39 shootout. He went 26/33, had 342 yards passing, 97 yards rushing and threw four touchdowns on the day with one interception against a very good Texas defense and secondary. That was really impressive to me, but he still has some things he needs to improve on. Personally I think he is more of a mid-round selection, but he has good size, mobility and arm strength, so there is plenty of talent worth developing. He doesn’t go through progressions well and his footwork and mechanics are still a work in progress, but that can be coached up. As a mid-round selection he presents good value, but I would be a little surprised to see him creep into the 3rd round unless he shows significant progression in going through his reads and in his footwork as a senior. 6- Greg McElroy, QB, Alabama- I honestly didn’t anticipate McElroy being this high on my list, but I have seen more of him than I have of Dalton, Mustain or a couple other players, so I am rather comfortable with what he can do. He may not ever be a great NFL starter, but I do think he can start in the NFL and that makes him stick out among many of the remaining senior QB’s on this list. He has proved to be a competent game manager at Alabama, and even though he has it pretty easy on offense with Mark Ingram, a good offensive line and Julio Jones he has needed to step up at times too, and step up he has. If McElroy was as bad as some say he is Alabama wouldn’t have gone undefeated and won the National Championship last year. Yes, there are definitely better QB’s than McElroy, a number of them are on this list, but he has been effective enough at Alabama that he will get a chance to make a team as their #3 much like his predecessor John Parker Wilson did with the Atlanta Falcons. If he can grow into a more critical role this year it will only help his NFL prospects, but I’m not sure he will ever be more than a game manager and a late round pick. 7- Tyrod Taylor, QB, Virginia Tech- Tyrod is a player I would not have placed this high on this list a few months ago, but he belongs this high now. I saw him take great strides as a junior, and that culminated in his impressive performance against Tennessee in Virginia Tech’s Chick-Fil-A Bowl win. You can see my analysis of that game below this post. In any event, Tyrod still needs development but he has come a long way in his time at Virginia Tech and at this point he definitely warrants a 6th-7th round pick, and I think a strong senior season could improve those prospects. 8- Andy Dalton, QB, TCU- Dalton is a relative unknown to me, but I do have a game of him to watch so I will make sure I take a look at that. I know he had a very ugly game against Boise State that involved three interceptions (that is the game I have to re-watch, so that probably won’t be pretty) but I need to see Dalton excel when he is tested with similar competition to his own TCU team. He was tested against Boise State and the results were not promising. I think he will have a good year as a senior, but until he proves he makes his team better and that he doesn’t wilt in the face of great opposition he will not be worth much more than a late round pick or a UDFA pick-up. 9- Mitch Mustain, QB, Southern Cal- Mustain is an interesting case because he looked like he was going to get off to a roaring start when he was a freshman at Arkansas but apparently there was some kind of a falling out between him and Coach Houston Nutt, and ultimately he transferred to USC. There he was unable to win the starting job when Barkley, Corp and he were competing for it, and now he is the primary back-up to Barkley. He clearly has ability as he was 8-0 as a freshman starter at Arkansas and he threw five touchdowns in the USC Spring game this year, so it will be interesting to see if he gets any snaps this year in garbage time or if he is forced to step in for Barkley because of injury, though hopefully Barkley stays healthy. In any event, Mustain clearly has the ability to play at this level, the only question is whether that ability projects to the NFL. It will be hard to say if we don’t see him play at all, but I think it’s safe to say that Mustain warrants a 7th round pick and if not that he should be a priority free agent signing, because I think he can make a NFL team as a #3 or as a practice squad player. 10- Ricky Stanzi, QB, Iowa- Stanzi is a guy that I am not a big fan of. He wins a lot and he was clutch last year, but I was never impressed with him when I watched him play. I saw him play live against Wisconsin and though they won that game I feel that it was more because of inept defense than because Stanzi played extremely well. All Iowa ran was quick slants and quick outs and the Badgers never got up on the line to press them and disrupt their routes, and seemed content to let Stanzi just pick them apart the whole way downfield before he would take a deep shot to keep the defense honest. It was very frustrating to watch since I was rooting for the Badgers, but it wasn’t particularly impressive on Stanzi’s behalf either. He will need to show me a lot as a senior to make me think he warrants a late draft selection at all. 11- Case Keenum, QB, Houston- Keenum is relatively well known because he puts up video-game like numbers at Houston, but the fact is he operates out of a spread offense and isn’t ready for the NFL at all at this point. Perhaps he will take some strides in this direction as a senior, but the offense he runs is not preparing him to make the jump to the NFL at all. So even if he is accurate and does have decent arm strength, it won’t matter. He will very likely fall out of the draft just like Graham Harrell did because he was a system QB and didn’t have the size or arm strength to make the transition out of the spread and into a pro-style NFL offense. 12- Mike Hartline, QB, Kentucky- I wanted to rate Hartline higher than this, but it was hard to do since he has been so inconsistent and he also has had some trouble with injuries. There is something about him that makes me think he could be a potential sleeper though, so I will say that I think Hartline could move up boards and end up getting drafted with a good performance as a senior. He has good size and the Kentucky passing offense just isn’t as effective without him. I will be looking to see how he does this year and will probably watch a couple of his games to see if his potential sleeper status is justified. At this point though, his best shot is being a UDFA. That could change, though. 13- Scott Tolzien, QB, Wisconsin- Tolzein looks like Peyton Manning compared to what Wisconsin dealt with in 2008 when Adam Evridge was playing QB, but he has still not proved enough to me as far as the NFL goes to warrant being drafted. I do think he would get signed as a UDFA at this point, but I need to see more progression as a senior if he is going to sneak into the later portion of the NFL Draft. 14- Colin Kaepernick, QB, Nevada- I will say outright that I am not a fan of Kaepernick at all. He and Nevada have a great rushing offense and that is all well and good, but I am not impressed with Kaepernick’s passing at all. He has good numbers, but I don’t think he projects to be a draftable QB in the NFL at all. If he shows me something as a senior that could change, but as of now he is just a great runner with great size who can throw too. 15- Kevin Riley, QB, California- Kevin Riley was a guy who I thought could be much higher on this list before I watched him play last season. However, he really disappointed me when I watched him play against USC. Even with Jahvid Best he didn’t play up to my expectations. It will be interesting to see how he does as a senior, but I can’t imagine he will play any better now that Best has gone on to the NFL. Riley was very disappointing to me, and if he has a year like last season he will likely only get UDFA offers. Taylor Potts, the QB from Texas Tech, warrants an honorable mention here because I like his toughness, his intelligence and he played well as a first year starter the year after Graham Harrell graduated, but like Harrell he will likely be unable to shed the “system QB” tag and will go undrafted. Whether he sticks with a NFL team or moves on to the CFL or another league is up to him, though. So there you are, my top 15 senior QB’s for 2010. Hopefully that was a good read, and again I am sorry that I have not been posting as regularly as I have been previously. Locker was impressive in this game. He wasn’t amazing, but he was pretty good. He has good arm strength and zip on all of his passes and has impressive accuracy. When he sets his feet or even at times on the run he can put the ball wherever he wants it. He has impressive athleticism and toughness, though I waited the majority of the game for him to step into a throw knowing he was going to take a big hit. He has come a long way since his freshman year in terms of his footwork, but he still has a ways to go. He looks more comfortable in his drops, but still needs to clean them up a bit. Once he sets his feet, he needs to step into the vast majority of his throws which he does not do right now. When he does he delivers accurate passes almost every time, but when he doesn’t it is much more of a toss-up. He can throw accurate passes off his back foot or off-balance which is why he can get away with it, but he needs to learn to step into more of his throws even if it means taking a hit for it at times. Those are his major issues with footwork, and I didn’t see any instances of him having trouble with his release, it looked clean the whole game. He still has a tendency to throw some balls into coverage or force passes across his body or when he is off-balance, which is a bit of an issue. But there were plenty of signs that he has matured in this area as well. I doubt he will ever be a 100% pure polished QB in that he doesn’t take some chances, perhaps similar to Brett Favre, but I think there is more room for him to grow in this area before he leaves for the NFL. It will be interesting to see what strides he takes in this regard as a senior, and if he took any significant ones as the year went on in 2009 when he was a junior. One thing I really want to see Locker work on is using his eyes and going through his progressions better. One thing he didn’t do very well in this game was to go through two or three of his progressions before he looked to scramble. At times the protection just wasn’t there so he was flushed out of the pocket, but there were times when he would look at his first read and then start to roll out to buy more time unnecessarily. This is something he did less than he used to, but it was still something that warranted mentioning. He needs to work on that to be sure. But one thing that he only flashed the ability to do was to look off the defense with his eyes and then deliver a throw to an open receiver that he intended to throw to the entire time. He showed this ability a few times, but he threw the ball 30+ times and he only did this four or maybe five times. I would like to see him do this much more often as a senior, and it will be interesting to see if he does a better job of going through his progressions and of looking off defenders in later games as a junior. But this was one thing that I really thought he needed to work on. Overall, I am happy with how Locker looked in this game, though I think he could have been much better than he was. It will be interesting to see how he looks in later games from his junior year and how he looks in his upcoming senior season. I also paid attention to a few other players, though not as closely as I paid attention to Locker. One of the players that just kept showing up was Jurell Casey, a DT on USC. He routinely beat his man and penetrated into the backfield. He had at least two TFL’s versus the run, and a number of stops for limited gains versus the run. On top of that he helped flush Locker from the pocket multiple times, and his pressure allowed Everson Griffen to clean up Locker and get a sack in the 1st quarter. He was very impressive in this game, and I am very much looking forward to seeing him in this upcoming season. He is definitely going to be high on my DT rankings when I come out with them. I also noted how redshirt-freshman RB Chris Polk looked. He had some running lanes at times, and showed pretty reliable hands out of the backfield, but he didn’t have a great game as far as I could tell. There were a lot of rushing attempts Polk had that were good for losses or very limited gains. I didn’t note exactly why he wasn’t effective, but generally I think USC’s defensive line just won the battle against Washington’s offensive line often. He didn’t dance around in the backfield or try to bounce too many runs outside, so I don’t pin those short or negative gains on him. 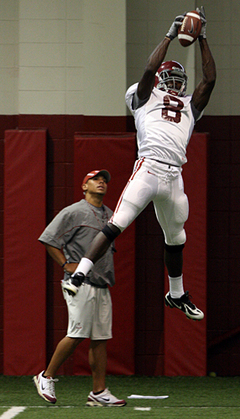 Locker’s favorite target on the day seemed to be James Johnson, a freshman WR last year. He had a lot of catches in this game, and routinely made big catches for first downs whether he was in traffic or if he got open. He made a terrific catch on the sidelines with a defender draped over him on a 3rd and long on a perfect throw from Locker. He impressed me all game, though I did not pay attention to his blocking. He caught the ball with his hands away from his frame instead of letting the ball come into his pads in every specific catch that I remember from the game. He looks like he has a lot of potential, so it will be exciting to see how he develops this season as a sophomore. So that about does it. Hopefully you enjoyed reading my thoughts on how the various players from this game looked. I am excited to see all of them again this year, and had Matt Barkley been healthy for this game I would have watched him very closely as well. I will have a write-up on him eventually, probably for more than one game.